Do you ever get the feeling that something’s missing in your life? It’s good. It’s good that you get that feeling. It’s good that we get that feeling. It’s an expression of dissatisfaction. And I think, in a lot of ways, we’re taught that to be dissatisfied is a bad thing. I think in a lot of ways we’re taught to not necessarily talk about our dissatisfaction. The problem with that is that it prevents us sometimes from really looking at our dissatisfaction. Dissatisfaction is a powerful voice that God uses to speak to us at different times in our lives. And so today, what I really want you to look at is, what is missing in your life? When you think about your life—when you think about what’s working well, what’s not working well, what do you like in your life, or what don’t you like in your life—what are you dissatisfied with? What do you feel like is missing in your life at this time? Or, what are you dissatisfied with, and what is God saying to you through that? God speaks to us every day of our lives in a thousand different ways. And part of our spiritual journey is about recognizing the different ways. St. Ignatius was an incredible champion of awareness. In his spiritual exercises he talks about how God speaks to us even through our emotions. So if you get really happy, God is saying to you something through that happiness. 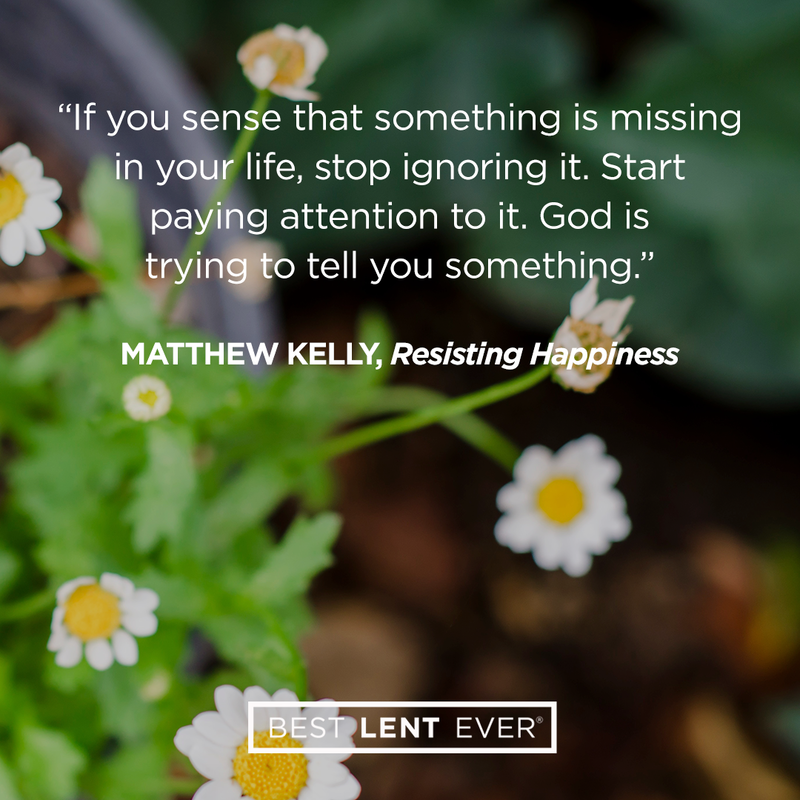 But if you get really mad—you want to throw something, or kick something—God’s saying something to you through that as well. So yes, God speaks to us through the Scriptures. Yes, God speaks to us through the life of the Church. Yes, God speaks to us through other people, some of them wise and some of them not. God sends unlikely messages at unlikely times through unlikely messengers. But God is constantly speaking to us, and he speaks to us through our dissatisfaction. So, at those times in your life when you feel like something is missing, don’t ignore that. Don’t push that aside. Don’t skip over that. Don’t pretend that’s not there. God is speaking into you. God is speaking into your life. So what do you feel is missing today? What are you dissatisfied with in your life today? And what do you think God is saying to you through that dissatisfaction? It’s time to start listening to what God is saying to you through your dissatisfaction. Don’t pretend to be happy and satisfied when you are not. Jesus, I am restless. I know something is missing in my life. Help me to hear what you are trying to tell me. Today’s personal reflection features Dynamic Catholic team member Michael Flanagan. Michael is our webmaster and comes to us from Independence, Kentucky. He enjoys coaching youth basketball for his son, served as a U.S. Marine, has saved three people from drowning, and has ridden in an elevator with Hulk Hogan. Has restlessness ever pushed you to become a-better-version-of-yourself?